The birth of cinema left a strong print in the cultural background of the islanders, changing in this way the Aeolians’ essence. 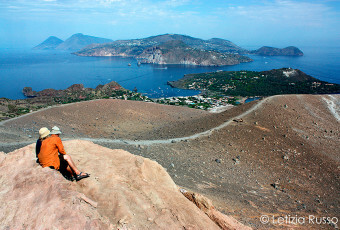 The first to promote the amazing landscapes of the Aeolian archipelago were the founders of Panaria Film: Francesco Alliata from Villafranca, Quintino from Naples, Pietro Moncada, and Renzo Avanzo, Rossellini’s cousin. These prominent personalities of the ‘40s, with the aid of their handmade equipment ,and rudimental techniques, created a diving suit for a movie camera, in order to realize shoots in apnoea. 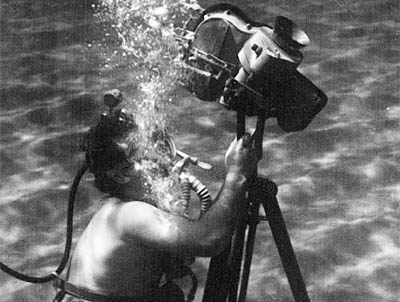 Their techniques became more elaborated with the production of a series of documentaries: Bianche Eolie (White Aeolians), Isole di Cenere (Ash Isles), and Cacciatori Sottomarini (Underwater Hunters), introducing in this way the first example of underwater shoots in the world, so as to create a prior event, used some years later by Dieterle for the shooting of film “Vulcano” in 1950. 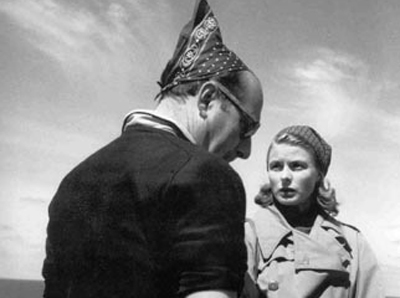 In 1949 Roberto Rossellini shot “Stromboli Terra di Dio” ( Stromboli, God’s land), with a female character Ingrid Bergman. The film was very successful, also because of the media scandal due to the liaison between the director and the actress; for weeks the newspapers related upon them, creating in this way the myth of the Aeolians , calling them “Wild Isles”. 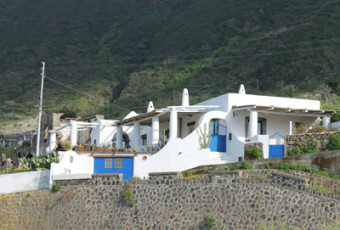 The film, entirely set on the Stromboli Island, left a strong print on the islander’s culture. Stromboli was an island used to solitude, but this film, thanks to its success, and to a changed cultural dimension of the place, permitted to create an advantageous relationship between foreigners and islanders. The film, hardly criticized, recorded the story of Karin, a young Lithuanian woman, who knew Antonio in an Italian concentration camp. He was an island fisherman, who trying to rescue her from imprisonment, decided to marry her. On Stromboli Karin faces a very different reality from that described by her husband, and runs into the inhabitants’ hostility. In the grip of desperation she decides to escape from the island passing through the volcano, but overwhelmed by fatigue and sulphurous exhalations, she falls asleep. Only love towards the baby in her womb gives her courage to continue. 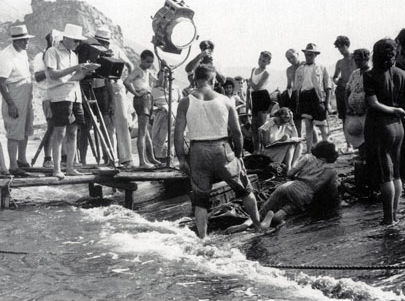 Quite at the same time of shooting “Stromboli”, Dieterle, under strong pressure of Anna Magnani, films “Vulcano”, the film set on the namesake island, concerning Maddalena, an ex-prostitute, repatriated by Naples’ Questura (Police Force) to Vulcano, her native land. She is well-greeted only by her sister Maria, she has not seen since she was a child, but not well-greeted by the islanders. Maddalena gets in trouble because of her sister, trying to free her from a shady man who oppressed her; she decides to make a rash action, turning off the air during the immersion. Bergman, Rossellini and Anna Magnani were the protagonists of the so-called “war of volcanoes”, the title which remained for weeks in the newspapers of the worlds. Magnani felt herself deeply hurt both sentimentally and professionally by her biggest love Roberto Rossellini, who gave the protagonist role to the beautiful Ingrid Bergmann in the film “Stromboli, God’s land”, the role which seemed to be written properly for Magnani. This fact brought to anger of Magnani who because of both sentimental and artistic delusion pushed the director Dieterle to shoot the film “Volcano”. They moved to Vulcano together with the staff of Panaria Film. Both troupes worked at the same time on the archipelago, struggling against heat, volcanic emissions, doubts and remorse. Betrayals, boycotts, and arduous underwater shots were the means of a war which took place at the distance of few kilometres. In 1959 it was Michelangelo Antonioni who made of the Aeolian Islands the set of his film “L’Avventura” which was showed during the 13th Cannes Festival, and which won the committee award. The film shows amazing shoots of the desolate island of Lisca Bianca where the first part of the film is set. Pirandello, in 1915 publishes the last episode of “Kaos” used by brothers Taviani in 1983 to shoot their film. The pumice caves of Porticello, in the Punta Castagna zone of Lipari became the setting of film of Taviani, the authors of this excellent and respectful reinterpretation of the most beloved themes and the atmospheres of the Sicilian playwright. Well-performed, with the great attention to details, and shot with mastery, “Kaos” is one of the best products of our cinema during the ‘80s. The Tavianis chose four stories of fields and farmers, of the humiliated and the abused, struggling against misery, injustice, and superstition; the best of them is perhaps “Mal di Luna” (The Moon ache), where a magic fusion between horror, pity and eroticism is reached.